Do you want to follow the example of successful businesses like Google and Amazon? One way to start is to allow employees to bring dogs to the workplace, just as they do. You wouldn’t be alone – it is estimated that 2.3 million dogs attend work each day with 1.4 million owners, and that’s not even counting one-person shops and those who work at home. While you will not be guaranteed to transform your company into an internationally-recognized brand overnight, you may take a step towards that direction. This article will cover the pros and cons of a pet friendly workplace, and will offer some guidance if your office wants to go to the dogs. Two important points before going further: first and foremost, this article does not cover service animals, including seeing-eye dogs. There is a whole special set of regulations and responsibilities when it comes to accommodating workers and members of the public who require assistance because of disabilities, and these rules and tips do not apply to them. Second, this article focuses on dog-friendly workplaces, so leave the ferrets and the cats at home. While some may choose to allow any type of pet at the workplace, most companies restrict their policies to dogs only (with perhaps fish also being allowed, given they are unlikely to escape the office or cause too much of a mess). Companies that offer dog-friendly workplaces cite numerous advantages to allowing the animals at work. Some reasons can’t be easily quantified – improved quality of life, better office morale, increased camaraderie, lowered stress, and greater happiness are all cited as positives. But beyond these warm and fuzzy reasons, there are some distinct advantages that may increase your company’s bottom line. Employees with dogs are likely to work longer hours since they don’t have to leave for doggy daycare at 5:00 PM. You will probably see decreased absenteeism because your workers won’t have to stay home to tend to their pets. 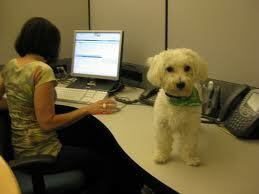 Employers often note increased productivity and efficiency when employees have dogs with them at work. Combine all of these factors, and also consider that employees enjoy saving pet-sitting money, and you have probably separated yourself from your competitors when it comes to attracting and hiring new talent. There is no doubt that, at least for some employees, a dog-friendly workplace is a benefit no different than healthcare coverage or three weeks of vacation, and they will choose where they work based on that benefit. On the other hand, remember that not all employees love dogs, and perhaps a pet-friendly workplace will be a disincentive to some current or prospective workers. For all of the benefits listed above, some workers – and customers – may view the atmosphere as too unprofessional. Further, there may be some industries where state or local regulations prevent dogs from being present, such as some restaurants, food stores, hair salons, medical offices, etc. If you are ready and able to move forward with a dog-friendly workplace, here are the steps to take and issues to consider. First, check to make sure that the building you occupy allows dogs, and also make sure that you have proper insurance to cover any injuries or damage that may occur. Next, take some time to consider what kind of rules you want to have in place, and put them in writing. Will you require all workers to prove their dogs have been recently vaccinated and are free of fleas, etc.? Would you want all dogs to go through a pet training class as a prerequisite? Will you do a trial run, such as dogs allowed on Fridays only for a month, before deciding your next step? Are there areas of the office where dogs will not be allowed (kitchens, work rooms, bathrooms, etc.)? Will all dogs be allowed, or only those under a certain weight? 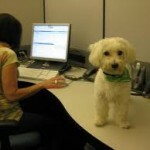 If an employee needs to go out of the office, where will the dog be kept in his or her absence? Finally, at a bare minimum, you need to address the following issues. If another employee has or develops an allergy to dogs, or perhaps even a psychological phobia to animals, you will need to accommodate that employee under disability law. Consider having a “dog free” area of your workplace, or installing high-grade filtration systems to reduce dander and hair. Make sure your policy addresses aggressive behavior against other employees and dogs, and enforce the policy by barring offending animals for good or until they are properly trained. And lay down rules regarding cleaning up after the animals, being clear about whose responsibility it is to wield the pooper scooper. This entry was posted on Monday, January 28th, 2013 at 11:31 pm	and is filed under Dogs, Human-Animal Bond. You can follow any responses to this entry through the RSS 2.0 feed. You can leave a response, or trackback from your own site.